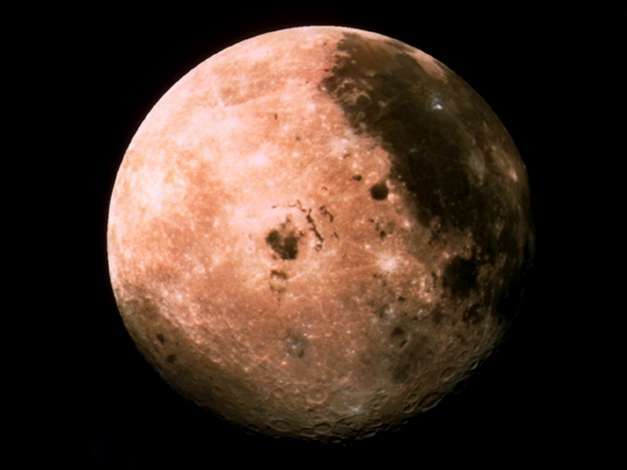 Information: This color image of the Moon was taken by the Galileo spacecraft at 9:35 a.m. PST Dec. 9, 1990, at a range of about 350,000 miles. The color composite uses monochrome images taken through violet, red and near-infrared filters. The concentric, circular Orientale basin, 600 miles across, is near the center; the near side is to the right, the far side to the left. At the upper right is the large, dark Oceanus Procellarum; below it is the smaller Mare Humorum. These, like the small dark Mare Orientale in the center of the basin, formed over 3 billion years ago as basaltic lava flows. At the lower left, among the southern cratered highlands of the far side, is the South-Pole-Aitken basin, similar to Orientale but twice as great in diameter and much older and more degraded by cratering and weathering. The cratered highlands of the near and far sides and the Maria are covered with scattered bright, young ray craters.